We have been sailing and visiting Madeira with our friends from SV Dunia. Dunia’s crew is a German family. It has been a great experience to spend time together, being part of the same family. Kids and parents had fun and grew up, learning about communication and tolerance. It is amazing to see this future generation playing together with their own language! Both families are proud of what they learnt together, kids really improved their confidence to speak with other kids in a different language. They used to share things between brothers and sisters, now they learnt to share and get on well with other kids. We almost met Dunia’s crew last August (2017): we were in the same bay the same day in Malta, but we never had a chance to spend time together before this February in Las Palmas de Gran Canarias. We were in contact and they arrived to Las Palmas in the same pontoon ; we got on well and we started to make plans together. Kids took kayak lessons together, we visited Las Palmas together and we decided to come back to the Mediterranean sea together. We left Las Palmas and spent a week in Lanzarote before heading to Madeira. Dunia left from Las Palmas directly to Funchal and we both met in Funchal : we arrived almost at the same time. Being with another family made me think about how I was treating my kids. I realised that I was sometime over-protecting them and not letting them experiment things on their own, especially when they were playing outside. I was not giving them the autonomy that they need to grow up. The 6 kids were very responsible and they were able to prepare and have dinner in a boat meanwhile parents went out to have dinner. We are very proud of all of them! It was great to have some kid-free time with other adults 🙂 it is difficult to fully enjoy time with other adults when you are surrounded by demanding kids, we had a super free of kids funny evening! 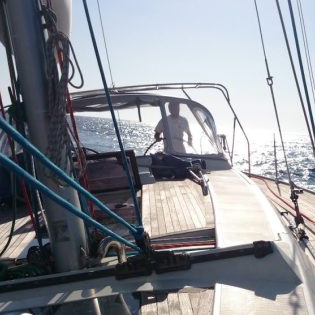 From Funchal, we went to Machico, we spent 5 days anchored at Machico and Abra bay with Dunia ; it was very windy, we registered winds of 40 knots on the first days. After a couple of days the wind decreased and we were able to inflate the dinghy and go to land for some walks together. We also have a girly time with Judith. We took the dinghy and went on land together in a small marina in the next bay. While leaving the marina, I failed to start the engine again because I forgot to re-install the circuit breaker (like a “key”) correctly. After just one try, the mooring man asked me if I wanted him to star the engine for me… Judith and I wondered if he would have asked the same question to Pierre or Timo. After Abra Bay, we went to Porto Santo, a small island with a 7 km long beach in Madeira archipelago, waiting for the next good weather window to reach the old continent. SV Soledad and SV Dunia left Porto Santo together for a passage bound to Cadiz. During the first 2 days we were able to keep in contact with the VHF radio, we called each other every 2 hours to check course, position and mood/morale of the crew. It was nice to talk with them during both days but we were faster than them and the distance between the boats was increasing, then on the 3rd day we lost contact. We decided to slow down and see if we could get back in contact again the following days. As soon as we got back online, we received a notification: Dunia was already docked in Puerto América. We all celebrated Madeira-Cadiz crossing together. Helping each other: if we need help we do not hesitate to ask each other. SV Dunia has been running some washing machines for us. Timo and Pierre were happy to help each other with the boat works. Sharing meals: We like spending time all together and we did not hesitate to organise a meal in one of the boats or going to the restaurant together. Most of the time kids and adults were in different tables which is giving to the kids and parents the autonomy that they need. Respecting kids chores: we involve the kids in what we are doing, specially when we are cooking or doing the dishes, they are proud to be helping us! Breaks from other families: Some days we need to have our own family time, we do not hesitate to let the other family. Women talks: Only women can understand how helpful is discussing with other women in your same situation, specially when you are sailing with your family and spending time isolated from others. After each discussion we both felt more confident as mothers and sailors. Thanks to Judith I feel confident to take the helm in the marinas while docking! Do you like to spend time with other family? Would you like to share with us what are you doing to make it happens successfully?